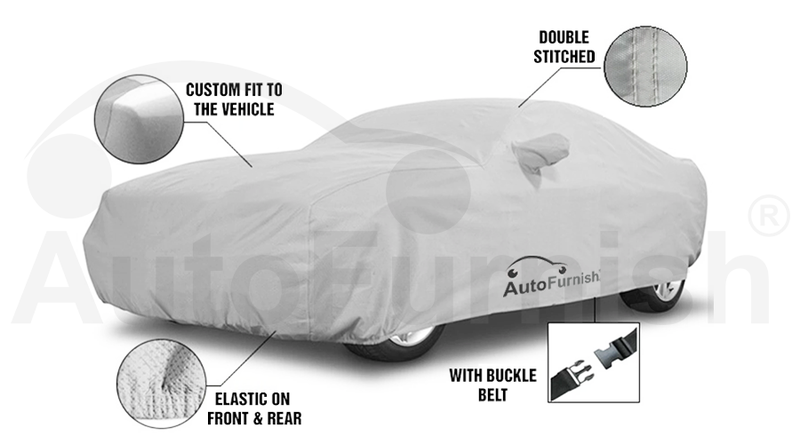 Autofurnish Parx Silver Car Body Cover is a custom fit solid silver color gives a whole new looks to your car. This car cover is made of 2 x 2 Silver Grey matty. This cover allows maximum air circulation under the cover, assures that any moisture or condensation under the cover can easily evaporate, and reduces heat on hot days. Double Stitched High Quality imported threads used to stitch the cover tight and securely protects your vehicle against natural pollutants, animal droppings, tree sap, industrial pollutants, and airborne dust and dirt. The inside material of the cover is very soft and is designed specifically to avoid any damages to the vehicle's paint during the course of removal or putting up the car. Disclaimer: This body cover is water resistant which means it is able to resist the penetration of water to some degree but not entirely.